Join us for the opening night of Night Light: An exhibition of Night Time Photography. See an amazing assortment of places, spaces and faces through the collective nocturnal lens of some of the finest night photographers in New England. In addition to works from our large group of featured artists, the show will be highlighted by a special selection of images from renowned night photographer and author, Lance Keimig. 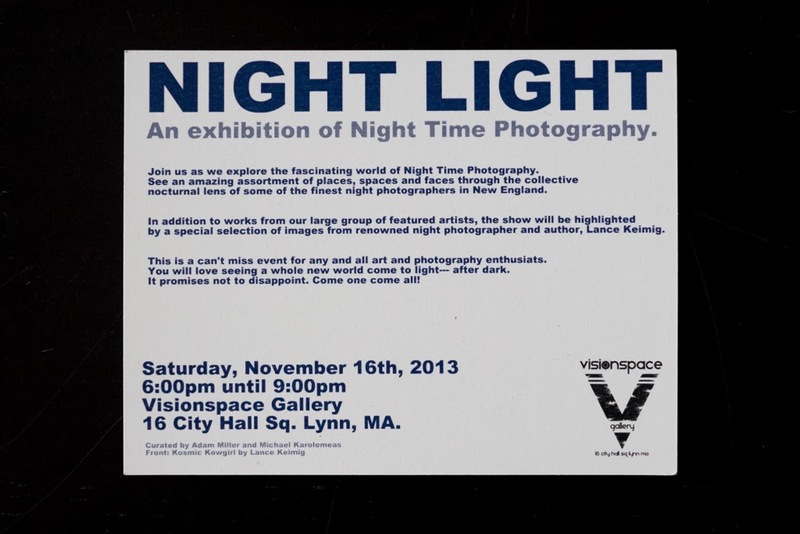 The artist reception takes place on Saturday, November 16th, 6-9pm at Visionspace Gallery in Lynn, MA. Lite fare and refreshments will be served with available cash bar. This is a can't miss event for any and all art and photography enthusiasts. You will love seeing a whole new world come to light --- after dark. Curated by Adam Miller and Michael Karolemeas. Support local art. RSVP on facebook.